There are lacing cards, jigsaws, posters, cut and stick activities and more in our set of ice cream printables. All looking good enough to eat. Here's something different! Print out this Complete the Picture page and get the children to draw in whoever (or whatever) is munching on the ice-cream! There are 3 scoops on the ice cream jigsaw - how yummy it looks! You can make our printable jigsaws as hard or easy as you want by choosing the right cutting guide. Here are our jigsaw instructions and cutting guides. Print our ice cream lacing card on to card, cut out and laminate before punching holes around the edge for children to practice lacing a piece of yarn through. They could try making patterns by lacing across the card. We have two versions of our ice cream poster, perfect for any summer themed classroom or library display. What is a visit to the beach in summer without an ice-cream? This "99 flake" is just what you need on a hot summer's day! 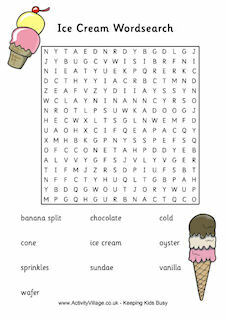 Keep children busy while they wait for that bowl of ice cream to arrive with our printable ice cream sundae jigsaw. Instructions and cutting guides to prepare your jigsaw are here. If you have a letter to send this summer, our ice cream writing paper will make it extra special. The paper comes in lined, handwriting or blank versions for you to choose from. Follow the instructions and cutting guides to prepare this cooling ice lolly jigsaw, perfect for chilling out this summer. This lovely, simple ice lolly lacing card is perfect for a food theme, for the seaside, or for summer! Punch holes around the edge of the lolly and give the kids a bright coloured wool to lace it up. Enjoy a taste of summer with our cool ice lolly writing paper.